3M™ PTFE Extruded Film Tape 5490, a PTFE extruded film with silicone adhesive, provides an exceptionally slick surface when applied and resists curling during unwind. 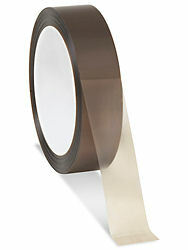 The PTFE extruded film tape has a chemical resistant surface for sealing and masking. The extruded PTFE film tapes lie flatter than the typical skived PTFE film tapes. With the thicker backing, it helps extend the service life, compared to thinner versions, when subjected to abrasion or wear. While providing excellent chemical resistance except to organic solvents, the silicone adhesive will be attacked by commercial organic solvents and is not recommended for applications requiring organic resistance. Some applications where the PTFE extruded film tape can be used include easy-release surfaces on rollers, plates, belts and other surfaces where build-up of sticky materials and inks can occur. It may also be used for low coefficient of friction surface on rollers and formers to facilitate web movement, along with wrapping rubber nip rollers on hot polyethylene extrusion machines. - Masks and reinforces rollers and belts. - Gray PTFE film backing with silicone adhesive.